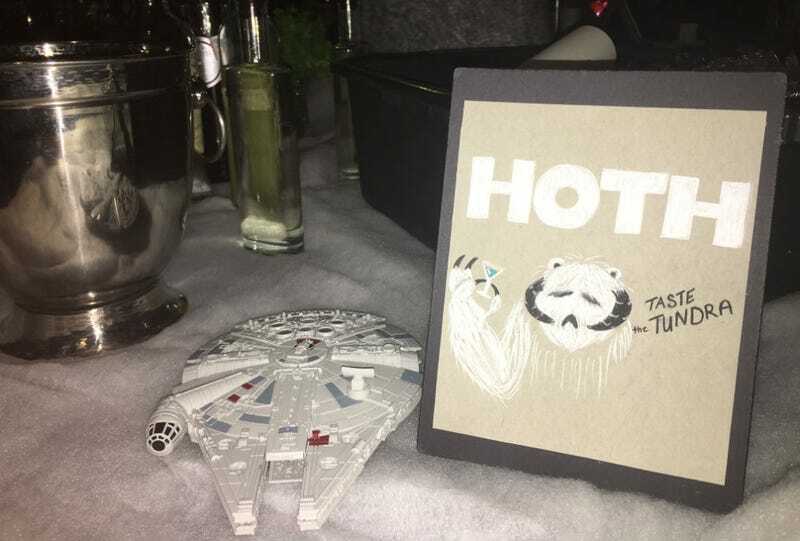 There are a lot of things I love about Fantastic Fest, but it’s hard to come up with a better one than a cocktail contest themed around Star Wars. For the second year in a row, the Alamo Drafthouse hosted a Star Wars Drink Competition, and I’m still a little buzzed from it. Basically, bartenders from Alamo Drafthouses all over the country are tasked with making drinks based on and inspired by the new upcoming Star Wars movie, in this case Rogue One: A Star Wars Story. The best from each market come to Fantastic Fest, where they are then pitted against each other; the winners, one selected by judges and another selected by attendees, will be on the menu at all Drafthouses during the release of Rogue One. This year the entrants all were themed around the classic gin cocktail called the Aviation, “a classic cocktail made with gin, maraschino liqueur, crème de violette, and lemon juice.” Gin is a rather appropriate ingredient, considering the name of Rogue One’s main character, Jyn Erso. The Protocol Droid from Alamo Drafthouse Yonkers, which had a spicy/bitter feel. The Kybercasm from Alamo Drafthouse Kansas City, which was grapefruity and refreshing. Ewok This Way from Alamo Drafthouse Houston, which was infused with blueberries and served with an oregano salt ring. The Living Force from Alamo Drafthouse Kalamazoo, which was a blend of light and dark ingredients resulting in a very crisp flavor. The Rosemary Rebel from Alamo Drafthouse Dallas, which had an orange color and bitter aftertaste. Endor Flight Training from the Alamo Drafthouse Austin, which had a robust earthiness and slightly bitter finish. Hoth from Alamo Drafthouse New Braunfels, which was colored blue and quite refreshing. My two personal favorites were the Ewok This Way and the Hoth, which had nothing to do with the fact the creators were cosplaying as Jyn and a Tauntaun, respectively. I voted for the Hoth, which ended up winning the judges award. The Ewok This Way won the audience award. You’ll be able to try these drinks at all Alamo Drafthouse locations come the opening of Rogue One in December. I recommend them both.